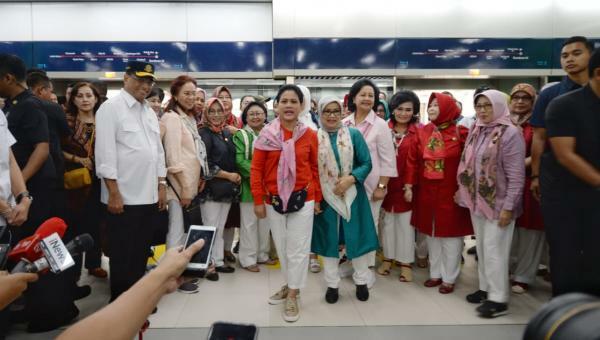 Minister of Transportation Budi Karya Sumadi has confirmed that Jakarta’s Mass Rapid Transit (MRT) which is set to start commercial operations on 1 April 2019 will provide women-only passenger cars during peak hours. “There will be women-only passenger cars designated only for women and children in the third and fourth sequence of train cars to protect them from severe overcrowding,” Budi said when accompanying First Lady Ibu Iriana, Vice President’s spouse Mufidah Jusuf Kalla and a number of spouses of Ministers of Working Cabinet joining in Organization of Solidarity Action of Working Cabinet Era (OASE-KK) in a trial run of Jakarta’s MRT, on Monday (18/3). The Minister appreciated the First Lady and members of OASE-KK for joining the trial run since they also promoted public transportation in general and MRT in particular to the people. “Public transportation must be promoted to the people,” he said. On that occasion, Budi also stated that President Joko “Jokowi” Widodo is slated to inaugurate MRT Jakarta on Sunday, 23 March 2019.